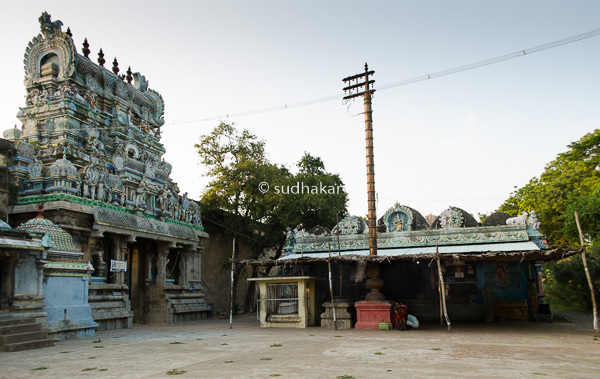 Meganathaswami Temple is a Lord Shiva temple located in Thirumeyachur, 18 kms from Mayavaram and 33 km from Kumbakonam. Moolavar is Lord Siva, known here as Meganatha Swami. Though the moolavar is Lord Shiva,this is a temple of ambal (mother) importance. The temple is famous for mother Lalithambigai. The temple has a 5-tier Rajagopuram and an outer prakaram(circumbulatory path). As soon as you enter the first praharam you will see the Lalithambikai sannidhi on the right.The sannidhi (sanctum) of Meganathaswami is inside another praharam with a small gopuram at the entrance. The moolavar (presiding deity) here is Shiva and he is called Meghanatha Swamy and the ambal is Lalithambikai also called as Santhanayaki. 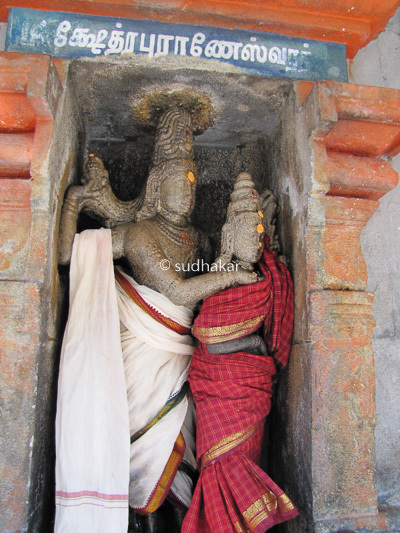 The idol of Ambal is about five feet tall and installed over a Srichakra.Lalithambigai in this kshetram is seen holding a parrot. According to legends, demon Pandasura was harassing sages and Devas. The Devas surrendered at the feet of Parasakthi for protection. Devi rose from a Yaga Gunda, mounted on the Sri Chakra Rath with the name Lalithambika, waged a war against Pandasura and destroyed him. Her fury did not subside even after that. Lord Shiva asked Sakthi to go to Earth,underthe name Manonmani and perform penance and shed her fury. Mother came to this place and became soft and merciful. According to legends and mythology, this is the birth place of Garuda, Aruna ( charioteer of Sun God), Vali, Sugriva, Yama and Shaneeswaran. There are shrines for Lord Brahmma,Vishnu and Lingodhbava (Shiva) and Chandikeswara with four faces. The sculpture of Kshetra Puraneswarar is very beautiful. 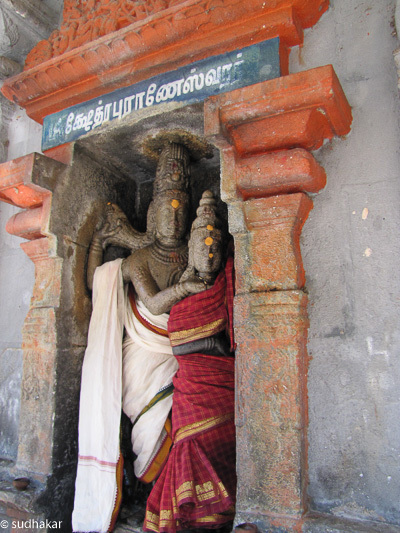 Kshetrapuraneswarar seen holding the cheeks of his consort and appears to be pacifying Her.The Mother idol appears to be angry from one side and santha swarubini (smiling and soft) from the other side. Lord Hayagriva who is a disciple of Mother Lalithambika,taught the greatness of Lalitha Sahasranama to Sage Agasthya. Sage asked Hayagriva for a suitable place in the earth to chant this great hymn. Lord said that the sage should visit a place where Mother graces in the name of Manonmani. Sage, and his wife Lopamudra came to Tirumeeyachur and chanted Lalitha Sahasranama before Mother Lalithambika. Pleased with his devotion, Mother Lalithambikai appeared before the Agastya and his wife in the form of Navaratnas. Sage Agastyar is believed to have then sung Lalita Navaratnamala in praise of the Goddess. He has also composed a hymn named Rahasyanamasahasram. Saiva saints Tirugnana Sambandar and Tirunavukkarasar have sung in praise of Shiva and Lalithambigai. In the year 1999,a devotee from Bangaluru had recurring dreams of Ambal asking her for a gold Kolusu (anklet). This woman went in search of the Goddess and visited various temples. By chance she saw an issue of Aalayam magazine in which Lalithambigai Temple appeared as the cover story and immediately recognised the Ambal as the one from her dreams. She had the anklet made and visited the temple. She told the priest about her dreams and wanted to offer the Goddess the kolusu. The priest said that is not possible since there is no way for the kolusu to go around Her feet. The devotee was persistant and the priest decided to have a look and to his astonishment could find a hollow place in the idol’s ankle and he could actually pass the kolusu through it. Following this incident, according to temple sources, devotees seeking wedding, child, pray to Mother Lalithambika by offering anklets. Beleifs and Rituals Devotees perform Ayush Homam and Mrutyunjaya Homam in this temple for longevity. They also offer Pirandai ( Cissus quadrangularris- Hadjot in Hindi) rice neivedyam(offering) to Lord shiva and eat it for cure from diseases and for longevity of life. Festivals Fridays are considered auspicious and the temple is a little bit crowded. During Navarathri festival, ambal is decorated in various avatars and special poojas and abishekams are performed. The month of Adi (Jul-Aug) is also auspicious here. Temple Timings It is normally open from 5 am – 12:00pm and 4.30pm- 8:30pm. How to reach? 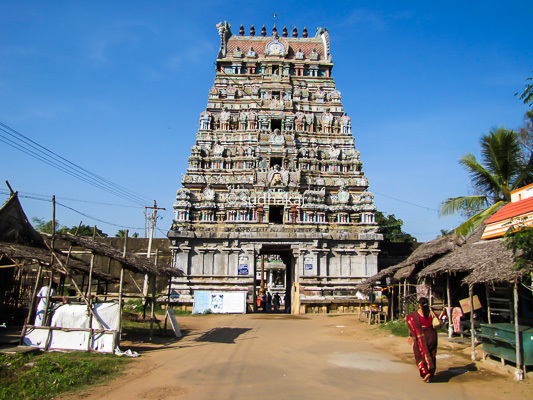 The temple is located at 33 Kms from Kumbakonam and 18 kms from Mayavaram. Plenty of local buses,cabs are available from Kumbakonam and Mayavaram. Where to Stay?There are plenty of budget and semi deluxe hotels are in Kumbakonam and Mayavaram. Where to Eat?There are not very good restaurants here. You may have to go to Kumbakonam or Mayavaram. Places nearby Kumbakonam and Mayavaram are places with many famous historic temples,Shiva sthalangal,Navagraha sthalangal and many divya desams. 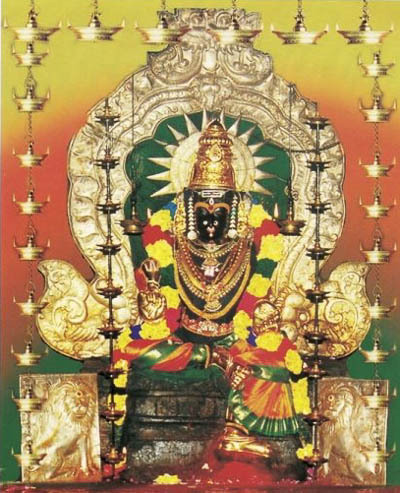 Contact Sri Lalithambika-Meganathaswami Temple, Tirumeeyachur-609 405, Tiruvarur district. Phone +91-4366-239 170, 94448 36526.